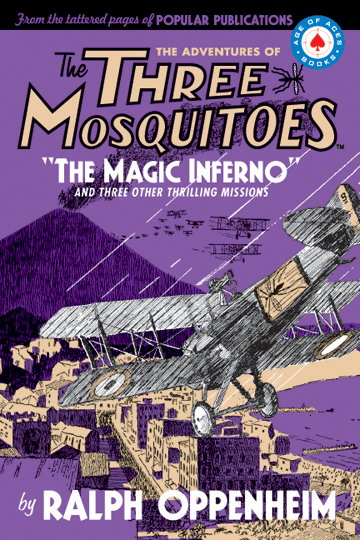 Once more their familiar battle cry rings out: “Let’s Go!” And the three khaki Spads take to the air flying into terror skies, each sporting the famous Mosquito insignia. In the cockpits sat the three warriors who were known wherever men flew as the greatest and most hell raising trio of aces ever to blaze their way through overwhelming odds. Always in front was Kirby, their impetuous young leader. Flanking him on either side were mild-eyed and corpulent Shorty Carn, and lanky Travis, the eldest and wisest Mosquito.